A modern, mid-townhouse situated in a cul-de-sac location offering easy access to the shopping facilities of Fosse Park and the local major road routes. The gas centrally heated accommodation comprises entrance porch, entrance hall, WC, kitchen, conservatory and lounge/dining room, with two first floor double bedrooms and bathroom. This spacious home benefits from double glazing and stands in easily maintainable gardens to front and rear, together with a single garage in block. The property would ideally suit the First Time Buyer and investment purchaser alike and we highly recommend an early viewing. EPC D. NO CHAIN. General Information: - The convenient and sought-after suburb of Western Park is located to the west of the City centre and is well known for its popularity in terms of convenience for ease of access to the afore-mentioned centre of employment and all the excellent amenities therein, as well as Junction 21 of the M1M69 motorway network for travel north, south and west, and the adjoining Fosse Park and Meridian shopping, entertainment, retail and business centres. Western Park also offers a fine range of local neighbourhood amenities including excellent shopping along Hinckley Road, schooling for all ages, a wide variety of recreational amenities including a fine park after which the suburb takes its name and regular bus services to the Leicester City centre. General Description: - Situated in a cul-de-sac location, this modern, mid-townhouse offers spacious accommodation comprising entrance porch, entrance hall, WC, kitchen, loungedining room and conservatory. To the first floor are two double bedrooms and bathroom and the property also benefits from a single garage in block and easily maintainable gardens to front and rear. Entrance Hall - With central heating radiator and built-in cupboard. Cloakroom - With two-piece suite comprising wash hand basin inset into vanitory unit with double store cupboard below, together with low level w.c. Also with tiled walls and UPVC sealed unit double glazed window. Kitchen - 8'11 x 8'8 (2.72m x 2.64m) - With single bowl stainless steel sink and drainer unit inset to marble effect worktop with range of drawers and cupboards under, tiled splashback and UPVC sealed unit double glazed window over, matching range of base units with marble effect work surface, drawers and cupboards under and complimentary range of eye level wall-mounted cupboard units over. 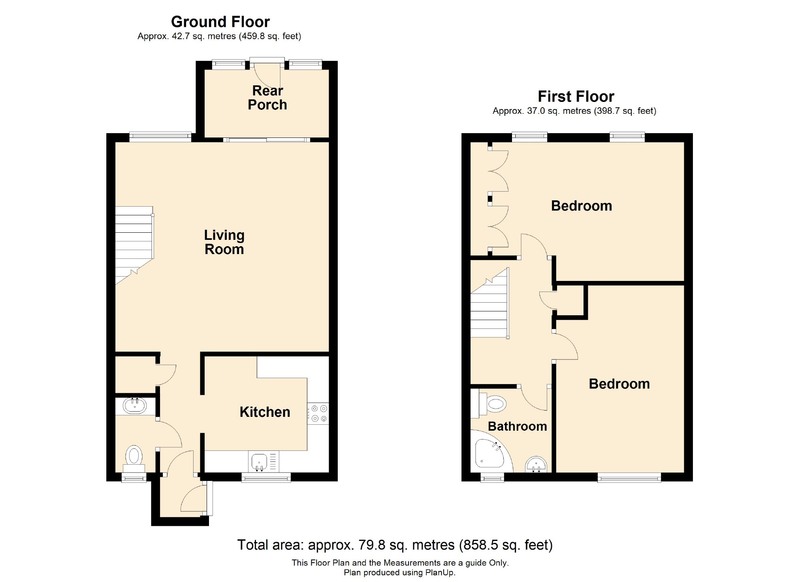 Also with space for free-standing cooker, utility space with plumbing for washing machine, tiled walls, glazed display cabinet and wall-mounted gas fired central heating boiler also supplying domestic hot water. Conservatory - 9'2 x 5'0 (2.79m x 1.52m) - Brick built with pitched polycarbonate roof and UPVC sealed unit double glazed door opening onto rear garden with matching UPVC sealed unit double glazed windows to either side. Bedroom 1 - 14'0 x 10'5 (4.27m x 3.18m) - With central heating radiator, fitted wardrobes, telephone point and UPVC sealed unit double glazed window. Bedroom 2 - 14'2 x 9'10 (4.32m x 3.00m) - With UPVC sealed unit double glazed window, central heating radiator and TV point. Bathroom - 6'3 x 6'1 (1.91m x 1.85m) - With three-piece coloured suite comprising corner panelled bath with separate shower unit over, shower curtain and rail, pedestal wash hand basin and low level w.c. Also with tiled walls, central heating radiator and UPVC sealed unit double glazed window fitted with vertical blinds. Outside: - The property has a paved forecourt garden area to front. Rear Gardens - The tiered rear gardens are enclosed by fenced surrounds and are easily maintainable, with steps leading to access to a SINGLE GARAGE IN BLOCK. Services: - All mains services are understood to be available. Central heating is gas fired and electric power points are fitted throughout the property which is double glazed with UPVC sealed units and benefits from a security alarm system. Directions - Proceed out of the City centre from St. Nicholas's Circle in a westerly direction along the A47 St. Augustine's Road, which eventually becomes Hinckley Road, and at the roundabout junction with New Parks Way and Braunstone Way, turn right onto New Parks Way. Take the first right onto Park Rise and immediately left onto Shire Close where the property can be identified by the agents for sale board.